Moscow (AFP) - The military intervention in Syria ordered by Russian President Vladimir Putin on Wednesday marks the first time that Moscow has taken part in a war far from its borders since its troops fought in Afghanistan in the late Soviet era. It comes after Russia's landgrab of Ukraine's Crimea peninsula in March last year, when its troops in unmarked uniforms took over military bases and government buildings. This sparked a bitter separatist conflict in eastern Ukraine that has claimed more than 8,000 lives, with Kiev and the West accusing Moscow of militarily backing the rebels. Since the breakup of the Soviet Union, Russia sent troops into several neighbouring states that it considers its sphere of influence, including a brief 2008 war with Georgia and an ongoing deployment in the breakaway Moldovan region of Transdniestr. Russia views these military actions as peacekeeping operations. Russia on Wednesday gained permission for military intervention outside its border from its upper house of parliament and carried out air strikes in three Syrian provinces. In late February 2014, Russian troops in unmarked uniforms and pro-Moscow forces took control of public buildings and military bases in Crimea. In March 2014, Putin signed a treaty absorbing Crimea into Russia which Ukraine described as an annexation. Russia defended its annexation of Crimea as "returning" part of the territory of the Russian Soviet Republic, which Soviet leader Nikita Khrushchev handed to Ukraine in the 1950s in a largely symbolic move. In April, pro-Moscow demonstrators seized government buildings in towns and cities in Ukraine's Russian-speaking east. Kiev responded by launching an "anti-terrorist operation." The armed rebels fought back, reportedly backed by Russian troops and heavy weapons. The Kremlin claims only Russian volunteers and soldiers on leave have fought alongside rebels in eastern Ukraine, but Kiev and the West say Russia has sent in military reinforcements and troops. The sides signed a ceasefire deal in February 2015 that was widely breached by both sides. A new truce that began this month has been strictly observed. Spiralling Russian-Georgian tensions over Tbilisi's pro-Western tilt culminated in a brief war in August 2008. Russia had previously trained and equipped troops in two Georgian separatist regions, Abkhazia and South Ossetia. Then-Georgian president Mikheil Saakashvili launched a large-scale operation on August 8, 2008, against South Ossetian forces who were shelling ethnic Georgian villages in the region. This was used by Russia as a pretext to invade and occupy swathes of Georgian territory. In autumn 2008 Russia recognised both secessionist territories as independent states and stationed permanent military bases there, but withdrew from Georgia proper. Moldova's Russian-speaking separatist region of Transdniestr broke away after a brief civil war in 1991-1992 that cost some 700 lives. 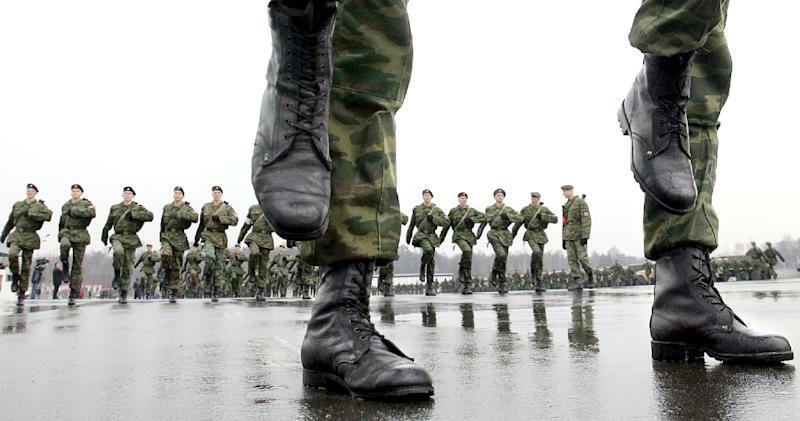 Russia deployed more than 3,000 troops there as peacekeepers and they enforced a ceasefire. Russian peacekeepers are still involved and stationed in the largely lawless region despite Moldova's calls for them to withdraw. The separatist pro-Russian government is not recognised internationally and is opposed by largely Romanian-speaking Moldova in a frozen conflict. Russia already had troops stationed in Tajikistan when a bitter civil war blew up in 1992 after the breakup of the Soviet Union. Moscow cast its role in the impoverished Central Asian country as only peacekeeping and protecting refugees, but it backed the current regime of President Emomali Rakhmon against the pro-Islamic opposition. Forces loyal to Rakhmon won in 1993 after a devastating war in which an estimated 150,000 people died. Russia has a military base in the strategic country bordering Afghanistan and has a long-term agreement to station troops there.